The weather is cooperating as of late and our fishing charters in Ft. Lauderdale have been a lot of fun and producing some nice fish. One foot sea conditions this morning and very little wind. 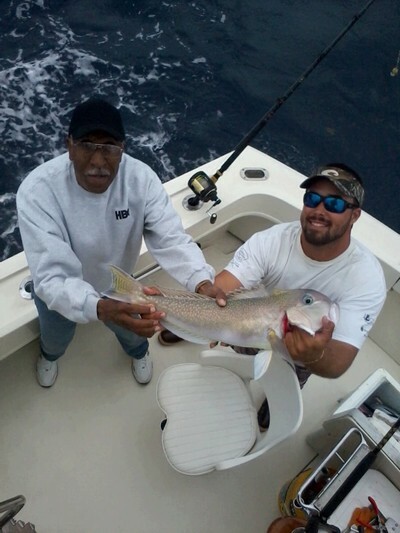 The fish in the picture is a good Golden Tilefish. He came out of 620 feet of water along with several others. There is a limit of one fish per angler and when they bite as they have been we can catch our limit easily. The Kings bit well today and around 120 feet of water was best for us. School sized Kings of about 5 to 7 pounds and all taken on the deep lines. Slightly murky water on the reef today helped the King bite. Some Cero Macks mixed in as well. Still some Mahi and Wahoo around but they have backed off since our last report. There are some Sails but they are elusive with few bites.